Multi-station that enables soldering, desoldering, and SMD rework all with a single unit. Single-nozzle hot air handpiece comes as standard equipment. Graphic LCD enables easy viewing and operation. 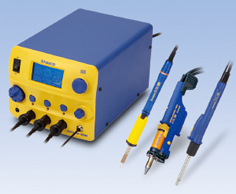 Selectable soldering iron for N2 system or micro soldering as usage at your option. Combines soldering, desoldering, and rework functions in a compact body. Features expandability in which the handpiece can be switched as needed for added functions.